First, preheat your oven to 325 degrees F. and remove your cream cheese from the fridge to soften. Next, in large mixing bowl with a hand mixer or using a stand mixer, combine the cake mix, water, eggs, oil, and pumpkin. Blend the batter until it is smooth and silky. Then, spray a donut pan with non-stick cooking spray, and fill each donut mold halfway full. Place the donuts into your oven to bake for 12 to 15 minutes. Last, remove the cooked goods from your oven and place them on a cooling rack to cool before icing. Repeat steps three and four until all the batter is gone. First, in a large mixing bowl with a hand mixer or using a stand mixer, combine the cream cheese, vanilla, milk, and powdered sugar to create the glaze. Next, mix everything until you have a thick but smooth topping. 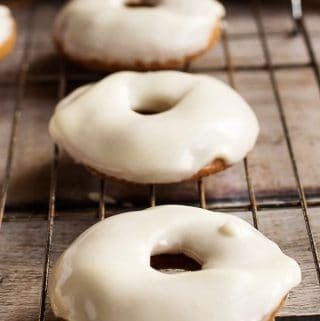 Last, once the donuts have cooled, use a tablespoon or spatula to apply the glaze to each pumpkin donut. Serve when ready. The calories listed are an approximation based on the ingredients. Actual calories may vary based on serving size. Pumpkin donuts can be stored in your fridge for up to three days in a sealed container.